The 2 month vaccines are very important, as they create a base for several boosters in the future. As children grow, they need vaccines and boosters to help them build immunity against incredibly serious diseases. Here are some of the basics about your baby’s 2 month shots and what you can expect throughout the process. What vaccines are recommended at two months? What can you expect at your baby’s appointment for her 2 month vaccines? The two-month checkup is crucial for ensuring your baby is growing properly; she will also receive her 2 month vaccines. The doctor will check her weight, length, and head circumference and create a tracking chart of the baby’s growth. A complete physical will be performed to ensure that the organs are all developing appropriately and that the legs and hip joints are moving as they should. Your child will receive between three and five needle pokes depending on whether or not the pediatrician opts for combination vaccines. Additionally, a liquid rotavirus vaccine will be given orally. Keeping your baby’s vaccines on the recommended schedule is crucial for ensuring all future shots are given during the appropriate growth periods. What are some common reactions babies have to shots? As with any medication, 2 month vaccines present a small chance of side effects. Tenderness, fussiness, slight loss of appetite, swelling, redness, and fever are often mild symptoms and go away on their own within 24 to 48 hours. Although extremely rare, more serious adverse reactions may occur including crying for three hours or longer, seizures, facial swelling, stiffness, or limpness. If your baby experiences any of these reactions, it is important to seek medical attention immediately. 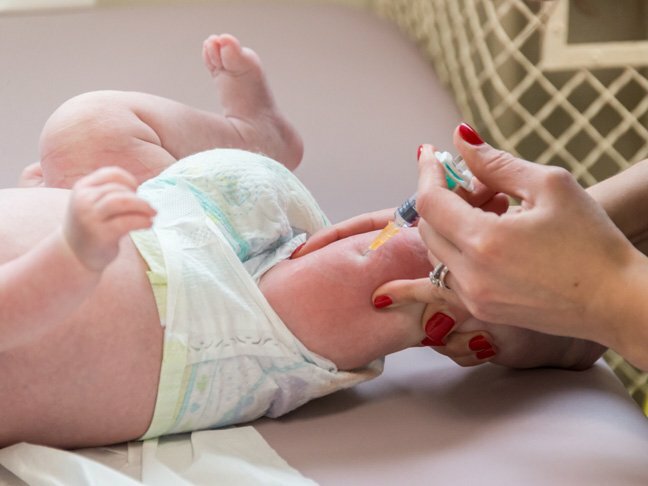 How can you soothe baby’s reactions to shots? Some moms find it beneficial to nurse babies, give them bottles, or provide them with pacifiers while they receive the shots. Holding your baby in your lap also makes them more comfortable. This helps to reduce the momentary pain baby feels during the process. Your baby will experience tenderness at the injection site. You can give him a warm bath to help ease the soreness after the 2 month shots are given. Your pediatrician can provide precise recommendations for caring for your baby after their 2 month vaccines. The American Academy of Pediatrics, as well as pediatricians across the country, stand firmly behind the safety of vaccines. Thanks to vaccines, several childhood illnesses have been eliminated across the United States and the number of hospitalizations and deaths from infectious diseases has declined dramatically.